Get unlimited access You have 10 articles remaining to view this month. Andrea Dovizioso led an all-Ducati top three in the first practice session for MotoGP's Austrian Grand Prix, while Valentino Rossi had a mechanical drama on his Yamaha. With a risk of rain for both FP2 on Friday afternoon and FP3 on Saturday morning, the field focused setting a fast lap in the early running. The three Ducati GP18s controlled proceedings early-on with Danilo Petrucci, Jorge Lorenzo and Dovizioso all taking turns in first place. 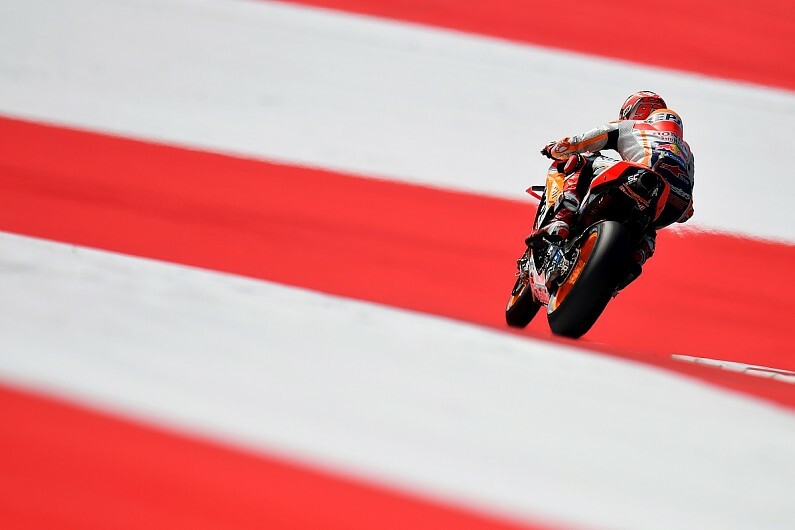 But it was Marc Marquez who led the way with a 1m24.411s before a mid-session lull, where the Honda rider was nearly four tenths quicker than Dovizioso. The Italian started a run 25 minutes into the session where he improved his own best time, and consequently closed the gap to Marquez on a couple occasions before he eventually took over the lead with a 1m24.295s. The top two remained unchanged until the final minutes when Dovizioso improved by nearly two tenths, only to be narrowly outpaced by Lorenzo. But as the chequered flag fell, Dovizioso lowered the benchmark even further and ended up topping the session with a 1m23.830s. Lorenzo was 0.215 seconds behind in second with Petrucci completing the top three nearly half a second off the pace. Rossi's bike slowed at the end of the main straight less than 10 minutes into the session, with his bike reportedly suffering a broken rear sprocket. He was able to continue soon afterwards but ended up finishing the session down in 11th. Honda duo Dani Pedrosa and Cal Crutchlow were sixth and seventh respectively, with Avintia's Tito Rabat bringing a fourth Ducati into the top 10 in eighth. Yamaha had a low-key session with Johann Zarco ninth on the Tech3 bike, closely followed by factory pair Maverick Vinales and Rossi, both more than a second off the pace. Aleix Espargaro was the top Aprilia rider in 12th as the sole KTM entrant Bradley Smith took 15th.